Hello everyone and Happy Friday! Today, I have a piece of jewelry to share with you. I designed a bracelet using several products from ButterBeeScraps and some of the pieces are not typically something you would think of to use for designing jewelry. But I think the pieces look good together and it adds more interest to the very simple design. 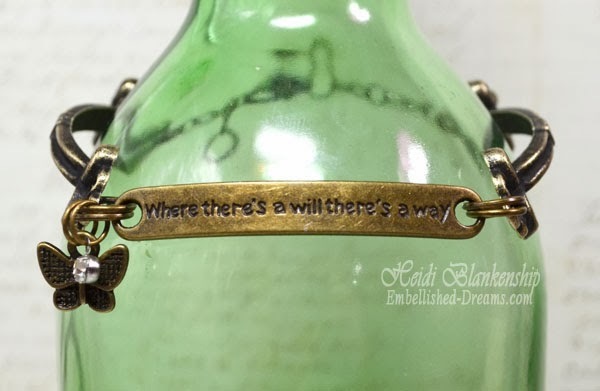 Here is a look at the bracelet. 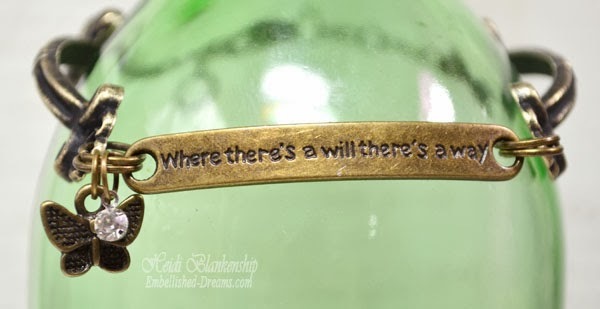 I used one of the Bronze Decorative Word Bands (Item #HD489-B) that says--Where there's a will there's a way--Gotta love that! I used the Bronze Jump Rings to attach all of the pieces together. I added a Bronze Miniature Butterfly Charm and a Rhinestone Charm. Do you see the decorative bronze pieces on the side? Any guess as to what those pieces are? 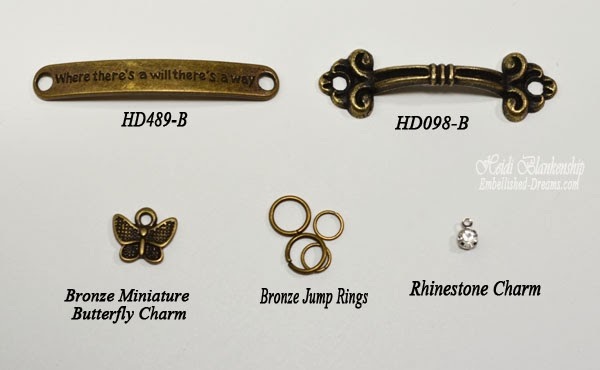 You might be surprised to know they are very small Bronze Drawer Pulls (Item #HD098-B)! They have a nice curve and fit perfectly around the wrist. The drawer pulls add just the right little decorative touch to this sweet but very simple design. These are all of the items I used from ButterBeeScraps to create the bracelet and they are in the link list below. I also used a little bit of bronze chain and a lobster clasp from my stash. Thank you so much for stopping by today! 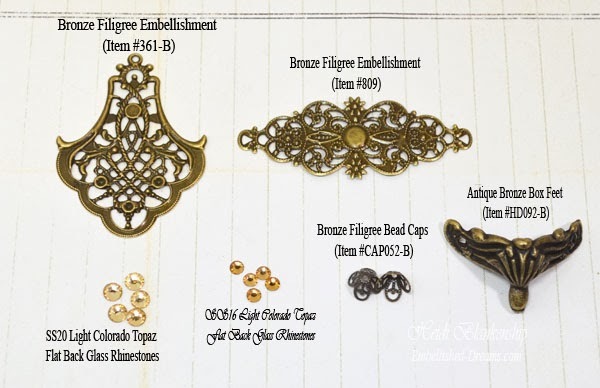 Please be sure to hop on over to ButterBeeScraps and check out all of the fun metal and filigree pieces for jewelry making or to use as embellishments for papercrafting and mixed media projects. Hello everyone! 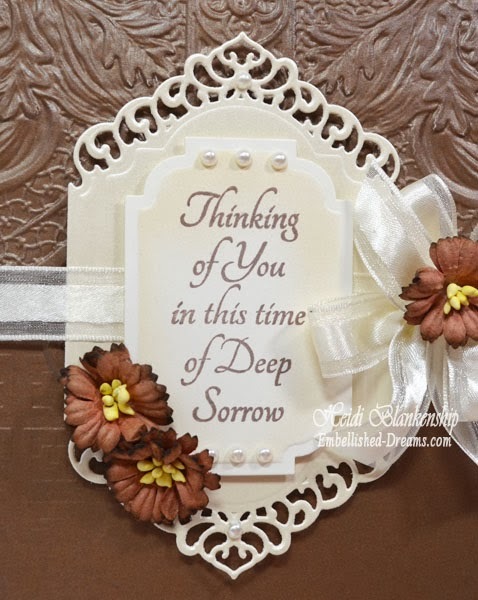 Today, I have a quick post and a sympathy card to share with you. For the background on this card I used Metallic Bronze paper and embossed it with the E3D-110 Roman Romance folder. I think this is such a pretty folder and I like how the pattern kind of fades away on the bottom. 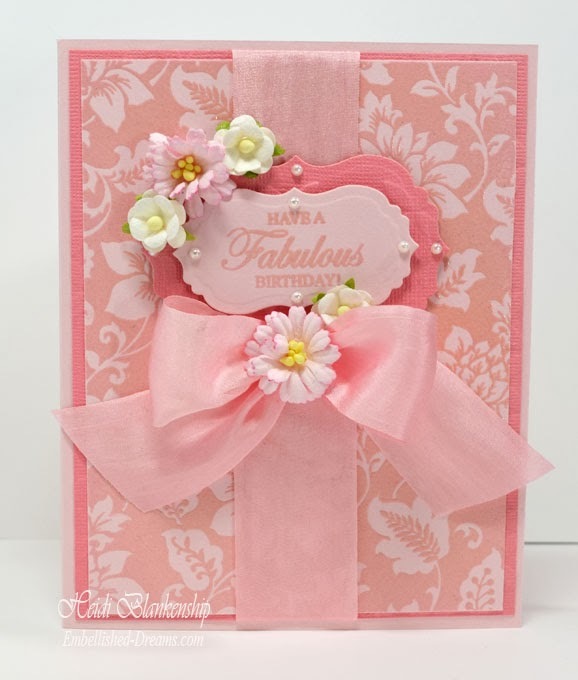 I used S5-218 A2 Divine Eloquence and S5-207 Labels 38 to create a couple die cuts and layered them. For the S5-207 Labels 38 I stamp the sentiment from the CR-03570 With Sympathy clear stamp set from JustRite Papercraft® and then airbrushed the inside edge with Copic marker E31. Here is a close up of the layers. To finish off the card I added an ivory bow, pearls and some WOC Flowers. Even though this is a sympathy card I really like the layout and by changing the sentiment this card could be used for several occasions. Hello blogging friends! 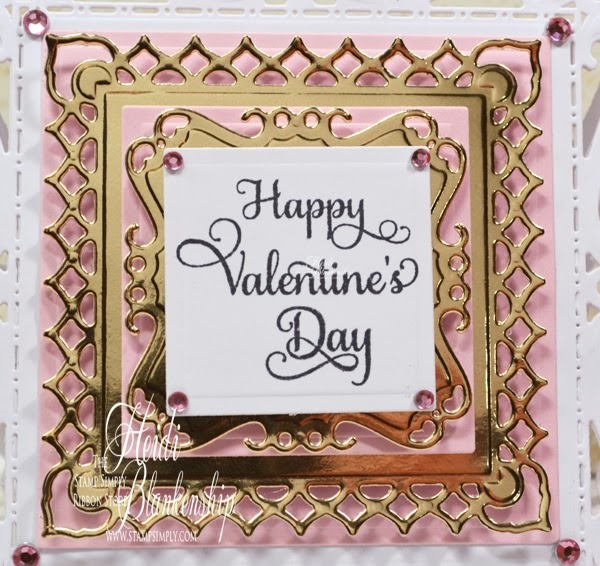 Today, I have a card to share with you using some of the New A Gilded Life die templates from Spellbinders Paper Arts®. I am loving the New product line from A Gilded Life! 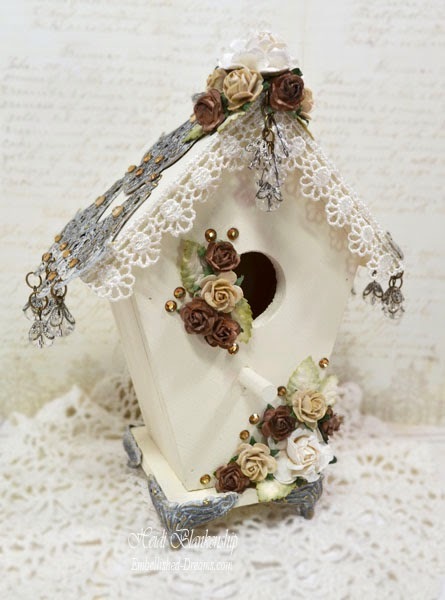 It's so romantic, vintage and shabby--so be prepared to see a lot of projects--LOL! 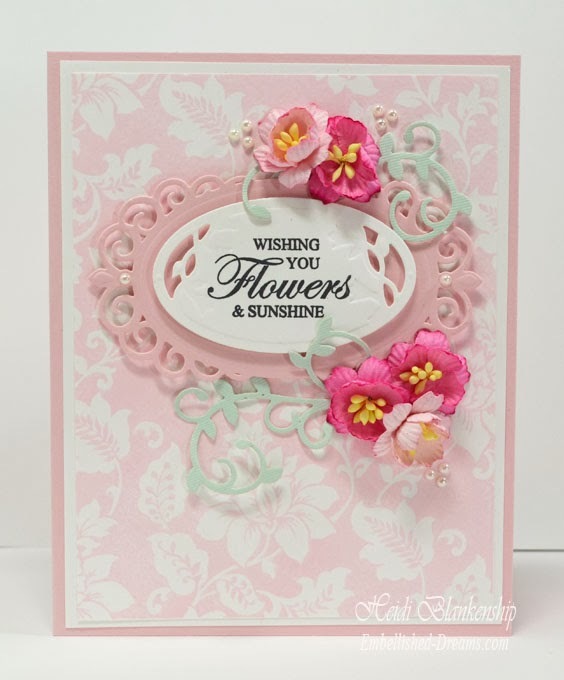 Here is the card that I designed using GLLD-006 Belgian Lace and GLLD-002 Imperial Border. These are two of the long dies--almost 8'' long--but they can be trimmed down too. For this card 6x6 I trimmed the die cuts a little. 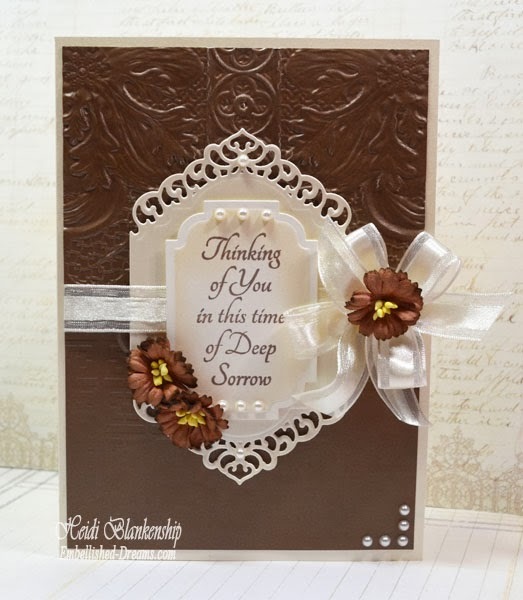 I used the GLLD-006 Belgian Lace die template to create layered die cuts for the background on the card. 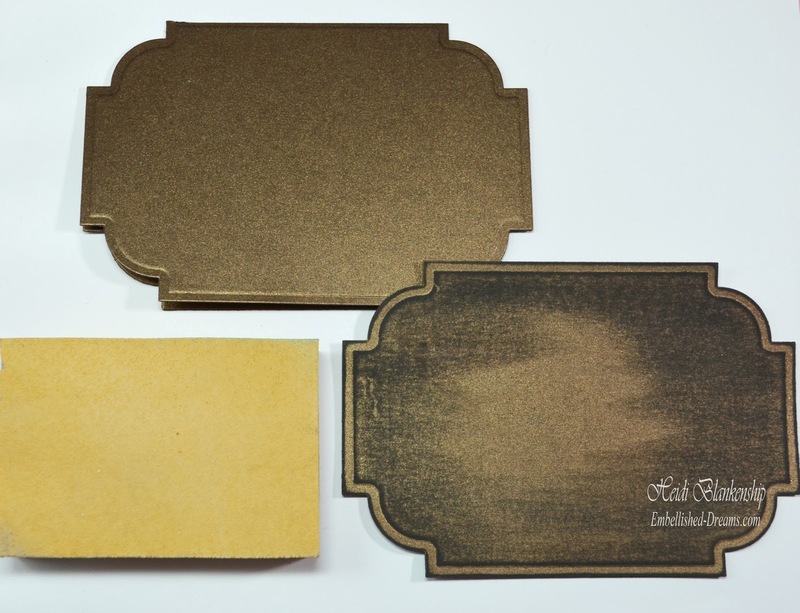 I used Simply Smooth Ivory and Oatmeal colored cardstock and then I lightly inked over the die cut with Antique Linen ink to make the embossed detail really pop. I used the GLLD-002 Imperial Border die template to make the rosette. 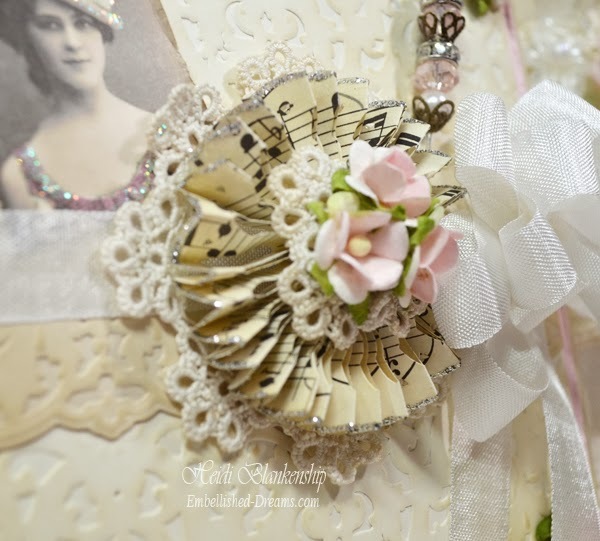 I used vintage sheet music and die cut four of the borders. Then I lightly inked the outer edges with Antique Linen ink. I cut off the rounded ends on the die cuts, glued them into one long strip, did the fan fold and glued into place to create the rosette. Here is a close up of the rosette. I added some vintage lace trim to the front and back of the rosette, a few WOC flower and then I edged the rosette with Silver Stickles. 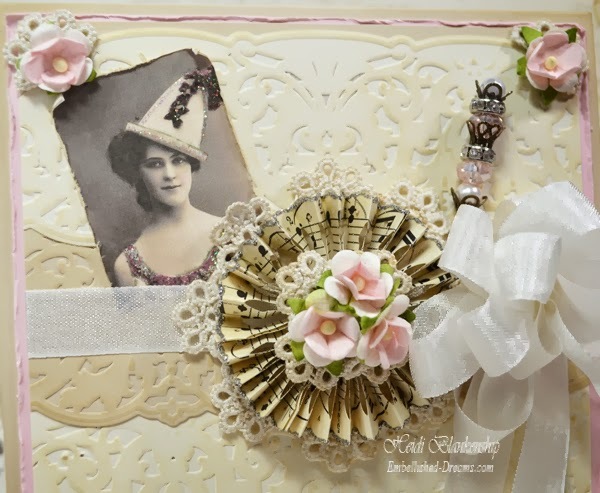 I added some vintage lace trim and WOC Flowers to the corners, a vintage style image, White Seam Binding from The Stamp Simply Ribbon Store and a handmade stick pin. For the stick pin I used some beads from my stash and a few Bead Caps and Rondelles from ButterBeeScraps. Hello everyone! 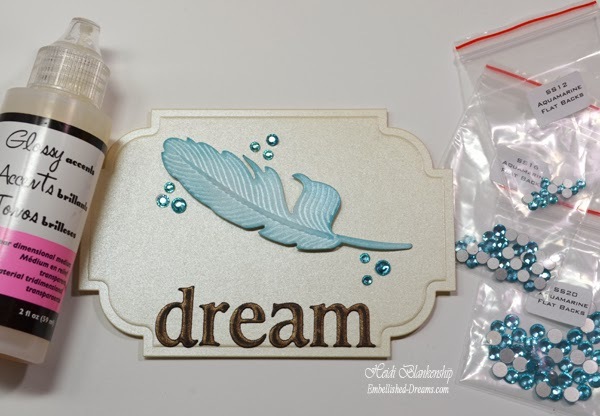 Today, I have a tutorial on the JustRite Inspiration Blog for Tutorial Tuesday. Here is a look at the cards I designed for Tutorial Tuesday. 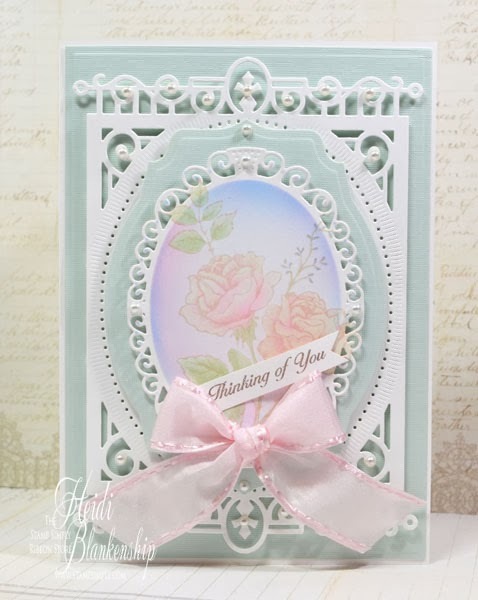 To win this week's Tutorial Tuesday Giveaway, leave us a comment (On the JustRite Inspiration Blog) telling us what else you would like to see a tutorial on and we will pick one lucky winner who will receive the two stamp sets that Heidi used in her tutorial CL-04490 Secret Garden Background Cling Stamp, CR-04450 Grateful Heart Vintage Labels Two Clear Stamps. Check back in next Tuesday to see if you are the next lucky Tutorial Tuesday Winner. Hello blogging friends! 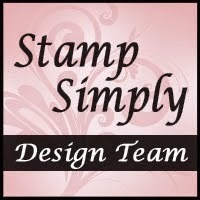 Today, is my day to post for the The Stamp Simply Ribbon Store and I have a pretty Thinking of You card that could be used for Valentine's Day, a Spring card or for any occasion when you want to let someone know you are thinking of them. I used Simply Smooth White Cardstock and DCWV Pastel Stack (Lt Sage Green) for the papers. I stamped the rose image from JustRite Papercraft CR-03570 With Sympathy using Memento Dew Drop Dye Ink 4 Pack - Arizona Canyon (Desert Sand) and I colored the image with Copic markers and the airbrush system. After I colored the image I used S4-425 Elegant Ovals die template to create the die cut shape. Then I used S4-418 Labels 36, S6-010 5x7 Heirloom Legacy, and S6-001 5x7 Matting Basics A die template to create all of the die cut layers. I used 3D Foam Squares in between all of the layers. Here is a close up of the rose image. I love how soft the colors are. When I am wanting to color an image with really soft colors I used Desert Sand Memento ink to stamp the image. I like the results a lot better then a dark brown or a black ink--it just keeps the entire image nice and soft. I stamped the sentiment using Rich Cocoa and then I fussy cut a small banner. I used 3D Foam Squares to pop the banner up just a little bit. To finish off the card I added a pretty pink bow using some ribbon from the May Arts Ribbon Sampler - Vintage Pink from The Stamp Simply Ribbon Store. I also added a few Melissa Frances Pearls - White. As always you can click on all the photos to enlarge them and all of the supplies are listed below with links. Hello blogging friends! Sorry I have been MIA! I know several of you are friends with me on my personal Facebook page and already know about this but for those of you who aren't we had a fire in our garage last week. Our neighbor took the dogs out before he was going to go to bed (about 11:30) last Thursday night and that's when he noticed smoke coming from our garage. He called 911 and then came over to let us know. Not exactly the knock on the door you want--to find out there is a fire!! He also moved our car as it was right in front of the garage. I woke my husband and youngest son up (oldest was at a friends) and we got out of the house. It was pretty scary since we had a couple of gas cans and a gas grill (with a propane tank) in the garage! But we were very lucky--they were able to put the fire out and it didn't spread to the house. A lot of stuff in the garage is a loss but it's just stuff--nobody was hurt, we are all safe, our house is safe and the stuff can be replaced. The garage is real pretty and colorful right now with blue and green tarps LOL! But it is what it is--we won't be able to do anything with it until early Spring when the weather warms up. But we are very thankful for our neighbors!! Today, I have a project to share with you using products from ButterBeeScraps. But before I get to my project I wanted to let you know Monique has added some NEW items to the store!! She has also taken some items and put together a few grab bags--these are limited--but Fantastic Deals!! Check out the video with all of the New Goodies! You can also visit ButterBeeScraps if you would like to do a little bit of shopping and get in on some of the great deals! Ok, now for my project! I altered a little birdhouse. 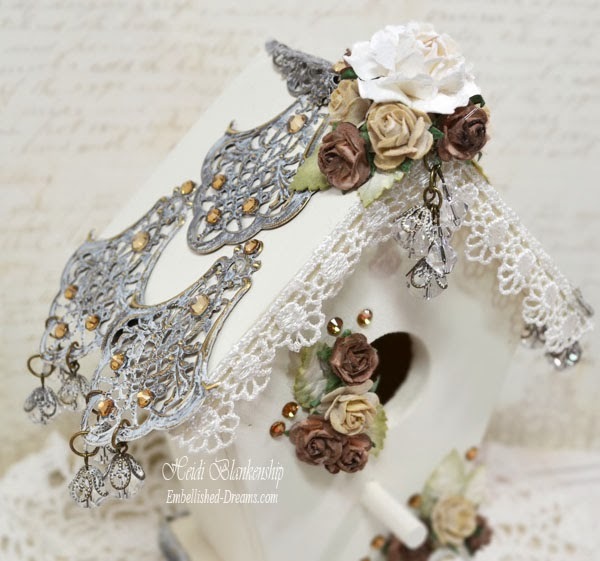 Using several of the filigree pieces from ButterBeeScraps I created this Bronze and Ivory Shabby Filigree Birdhouse. Here is a picture of all the filigree pieces, bead caps, box feet and crystals I used. All of the items are listed and linked below in the supply list. You can click on the picture to enlarge it and see the names of the items better. 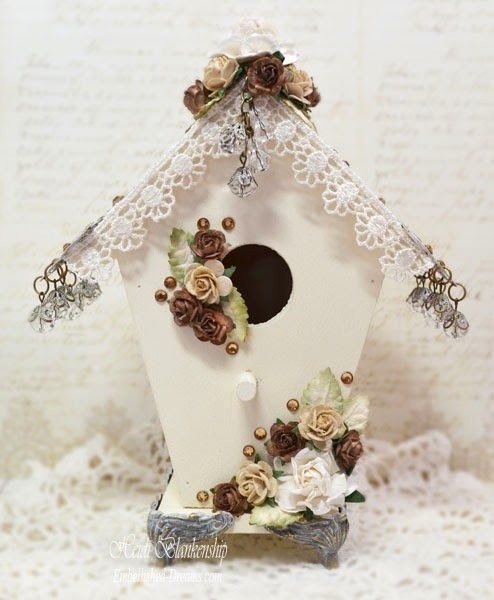 To start I painted the birdhouse with Vintage White acrylic paint. Then I used hot glue to add the feet and all of the filigree pieces. Next I went over the feet and filigree pieces with more paint and then I buffed off some of the paint for the metal to show through. I also painted and buffed the bead caps. 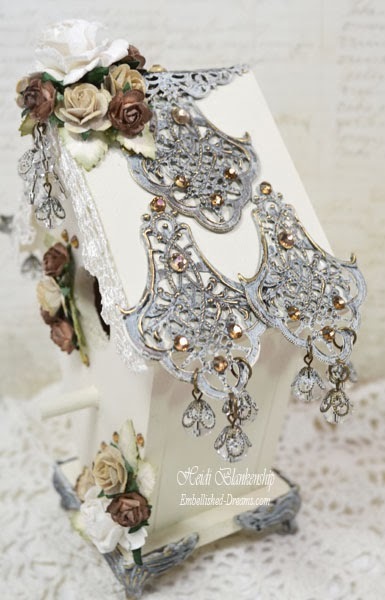 I added the topaz crystals to the filigree pieces and then I made little bead dangles with clear crystal beads. I also made a larger bead dangle for the top of the birdhouse. Here is a close up of the box feet. Aren't they so cute--I love how tiny they are! I also added a flower and crystal cluster at the bottom. Here is a close up of the bead dangles. I love these bead caps--I think they are my favorite! I also added a couple of flower clusters at the top of the birdhouse. I love how this turned out--so vintage and shabby looking! Thanks so much for stopping by today! I hope you are having a wonderful weekend and staying warm. We are in the middle of a blizzard here in MN and over night the temps are going to drop down -40 to -50 below!! Yep, you read that right--LOL!! Brrrr!!!!! Happy Creating, Hugs & Smiles! Graphic 45, May Arts printed ribbon, Prima, Spectrum Noir Blendable Pencils and many more LOL! My printer isn't working at the moment so I used Random.org and I picked 5 Winners. Very cool! You look great too. Dottie said...What a hallmark in your life! Its just a wonderful thing to be chosen for anything especially in the area of your hearts favorite things. I would love to win a copy of this publication; thank you for sharing this opportunity with us. If you could please send me an email at Floralfantasy@charter(dot)net with your contact information I will get the magazine in the mail and sent off to you. 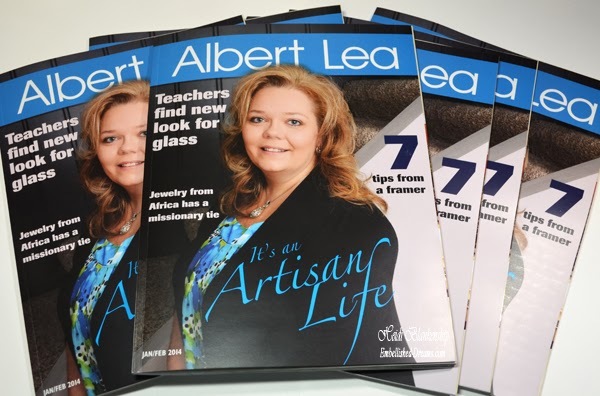 Thank you so much for all of your wonderful comments and emails about the article in the Albert Lea Magazine! I feel truly blessed!! I received several emails from people wondering if I would share more pictures from my studio space and yes I would be happy to do that--so look for that in an upcoming blog post. If you would like to read the article you can click HERE for the online issue. Ok, now for my project. 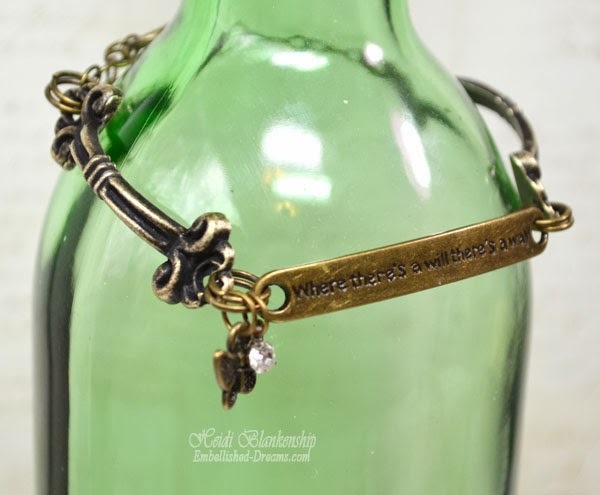 I created a bracelet using the NEW--A Gilded Life GLR-001 Relics A from Spellbinders. I used some floral link chain for the base of the bracelet and then I added white and cream vintage buttons with jump rings from ButterBeeScraps, champagne colored pearls, and AB glass crystals. I used mixed metals of bronze and silver with the jump rings and head pins. I love the look of the mixed metals. 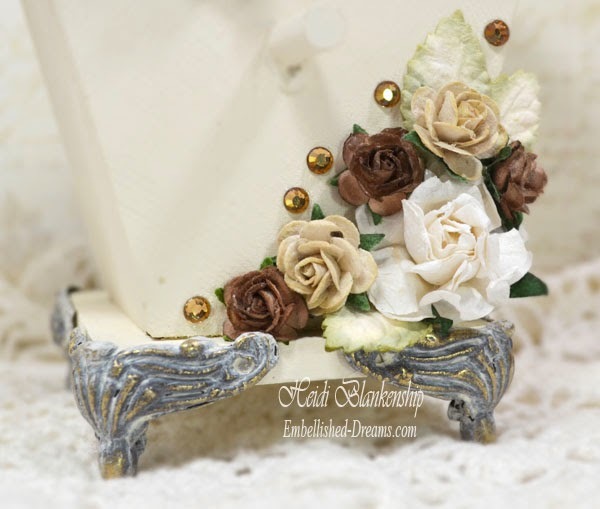 The Antique Bronze Toggle Clasp is from ButterBeeScraps. Here you can see the before and after on the relics. To give the relic pieces more of an aged look I added Antique White Rub'n Buff to each piece. I think the Rub'n Buff brings out more of the details in the pieces. I also added some SS12 Clear Flat Back Crystals from ButterBeeScraps to the larger piece. I am so happy with how the bracelet turned out and I just love the vintage look and feel! 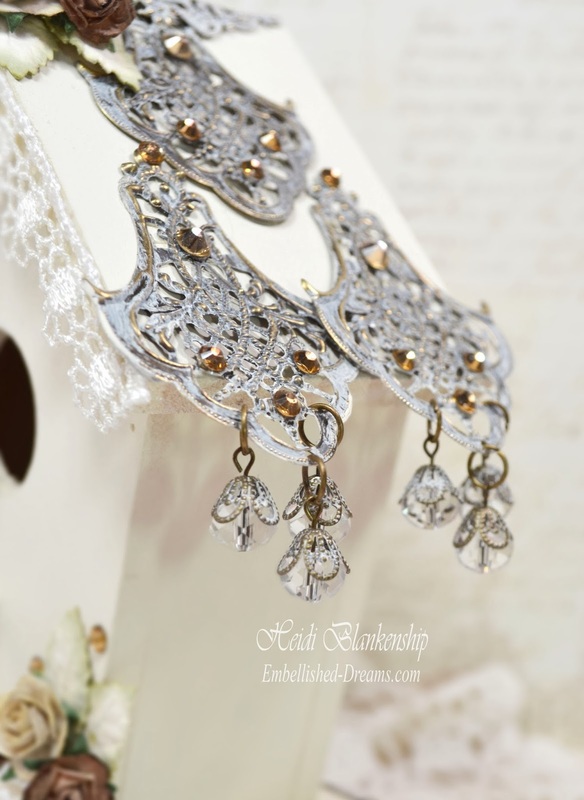 Have you had a chance to check out the beautiful New A Gilded Life products from Spellbinders? I think this whole new product line is fabulous!! Totally my style! Hello everyone! 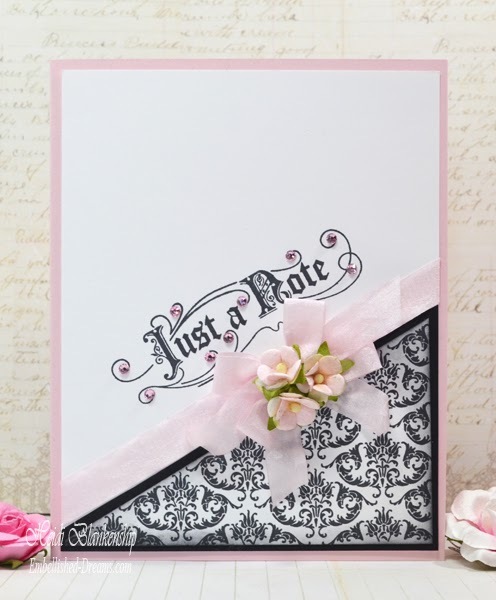 I am very excited to let you know I have a tutorial over on the JustRite Inspiration Blog today for Tutorial Tuesday and where I share a fun technique with you showing how you can take one background stamp image and get three different cards. Here is a quick look at one of the cards. To see the other two cards and for a full step-by-step tutorial click HERE. I hope you will check it out, leave a little love and let me know what you think about the tutorial. Hello blogging friends! 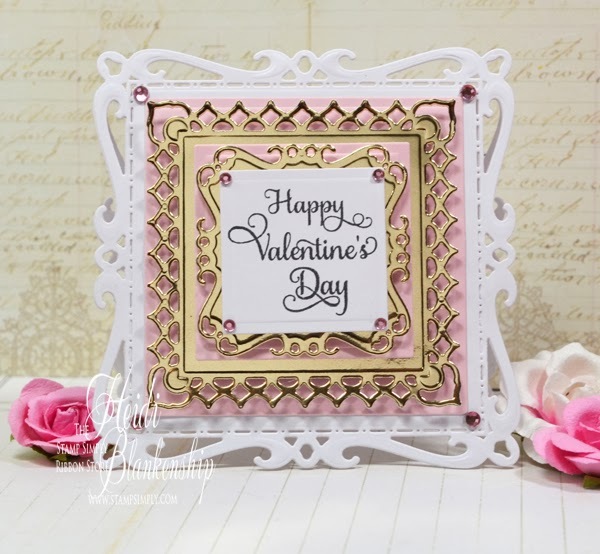 Today, is my day to post for the The Stamp Simply Ribbon Store and I have a CAS (Clean and Simple) layered shape card for Valentine's Day to share with you. I know looking at this card you might think it doesn't look like at CAS card but for the most part it is just layers of beautiful die cuts with a little stamping. 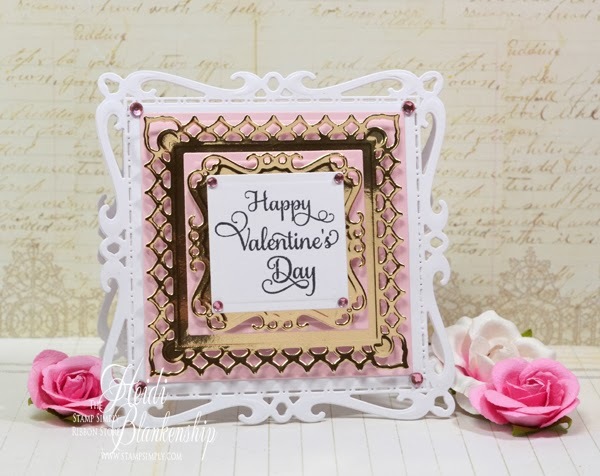 I used Spellbinder Paper Arts® S4-414 Captivating Squares and S4-126 Classic Squares Large to create the die cuts. For the shape card I used the largest die template (# 4) in the set to create the base of the shape card. 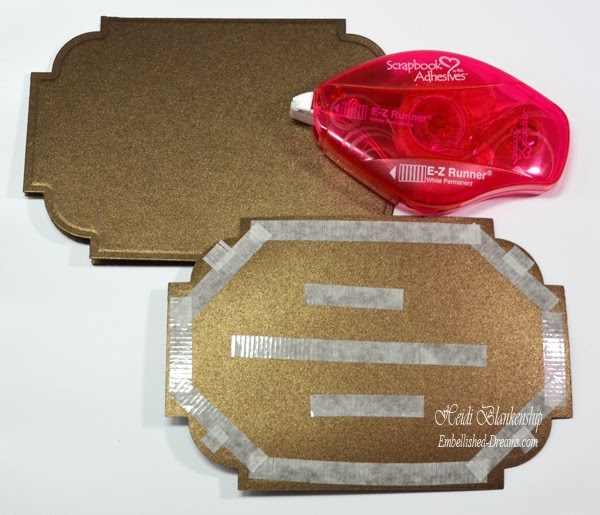 You can click HERE for a step-by-step tutorial on how to create a shape card with the Spellbinder die templates. 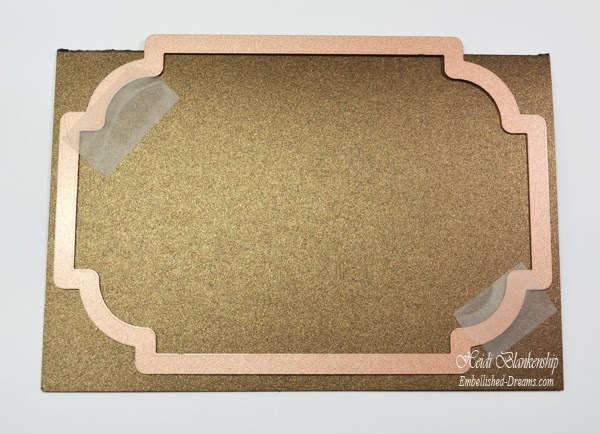 Check out this fabulous Bazzill Mirror Cardstock - Gold! 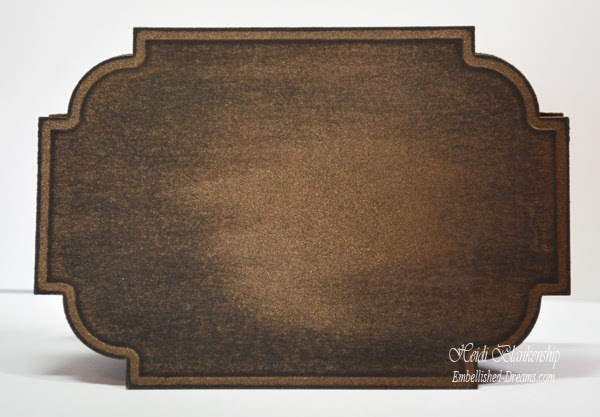 I love the look of mirror cardstock--it's so elegant. For the sentiment I used Memento Full Size Dye Ink Pad - Tuxedo Black ink and a sentiment from the JustRite Papercraft CR-04340 Hugs & Kisses Sentiments Clear Stamps. After I created all of the die cuts I used 3D Foam Squares and EZ Runner® Permanent Strips-Refillable Dispenser 49' from Scrapbook Adhesives by 3L® in between all of the layers. To finish of the card I added a few Rhinestones - Light Pink. All of the supplies for this sweet little Valentine's Day card can be found at The Stamp Simply Ribbon Store. I hope you had a wonderful and creative weekend! Hello and Welcome! Today, I am excited about sharing some NEW Spellbinders Paper Arts® die templates from the Winter 2014 Diamond Anniversary release. 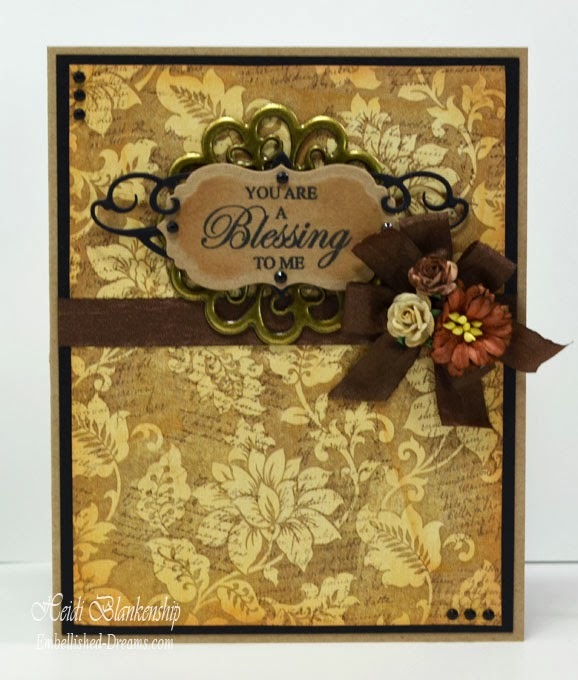 Not only will you have a chance to win the die templates I will be sharing with you but you will also have a chance to win the die templates being showcased on Candy Rosenberg's blog Living the Altered Life and Seth Apter's blog The Altered Page. Be sure to look at the end of the post for more details and instructions on how to enter the giveaway. 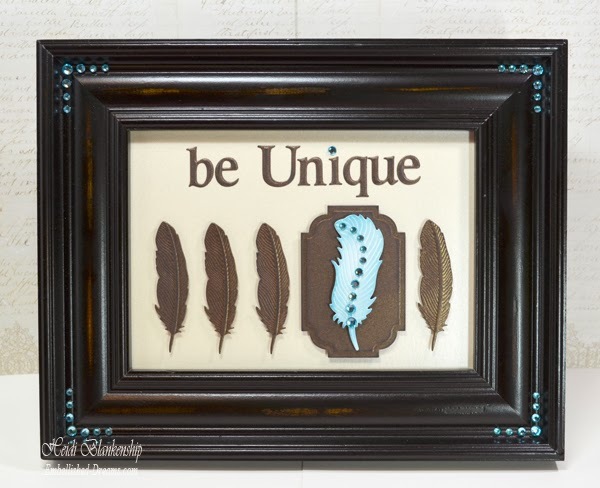 I am showcasing Spellbinders newest die templates S5-207 Labels Thirty-Eight and S4-428 Feathers and I have created three projects to share with you using both sets of die templates. Here is the shape card that I designed using S5-207 Labels Thirty-Eight, S4-428 Feathers. I also used S5-199 Font One Lowercase die templates. 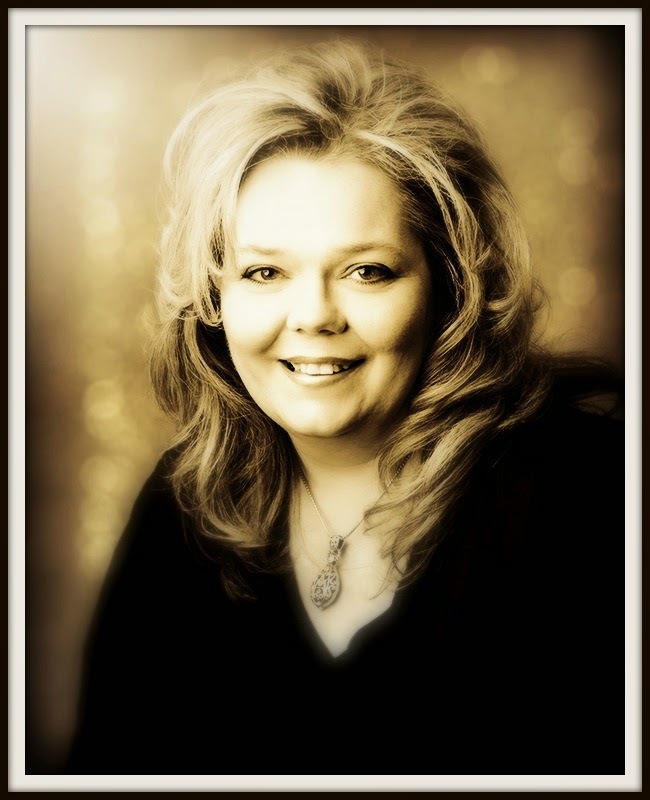 I have a step-by-step photo tutorial to share with you. To create the base for the shape card I started with a piece of bronze metallic cardstock 6-1/4" x 8-1/2" and scored it at 4-1/4" and folded. Using the largest die template in the set #7, I taped the cut edge of the die template off of the fold on the card base. With the cut edge off of the fold it will not cut the paper in this area. Next, using the same cardstock and die template cut/emboss the label shape. Then I lightly sand the outer edges of the label shape to reveal the black core and make the embossed details really pop. I applied EZ Runner® Permanent Strips-Refillable Dispenser 49' from Scrapbook Adhesives by 3L® and attached the two pieces together. Now I have the base of the shape card. 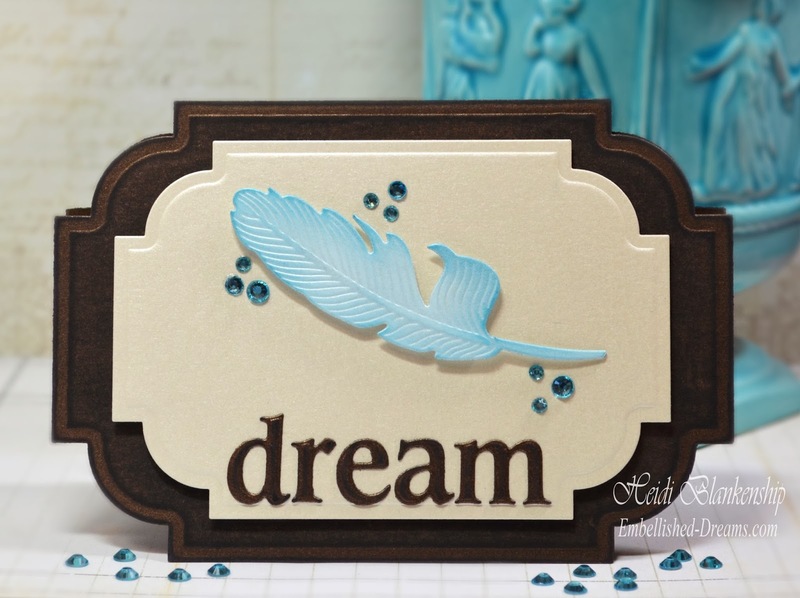 For the word Dream I used the bronze metallic cardstock and S5-199 Font One Lowercase die templates. Before die cutting I placed a piece of wax paper over the die templates and then I added the cardstock on top. I like to use wax paper when I am using small or detailed die templates. When doing this the die cuts will be very easy to remove from the template. Next I lightly sanded the die cut letters. 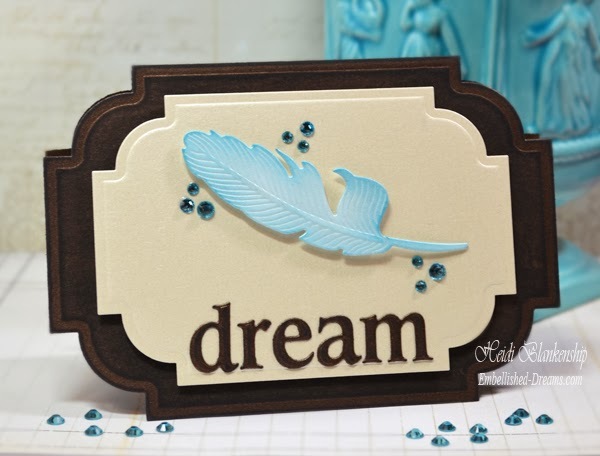 To create the feather I used sky metallic cardstock and S4-428 Feathers. I lightly sanded the feather to remove some of the sheen and get to the core of the paper. Doing this allows me to apply ink to the metallic cardstock. 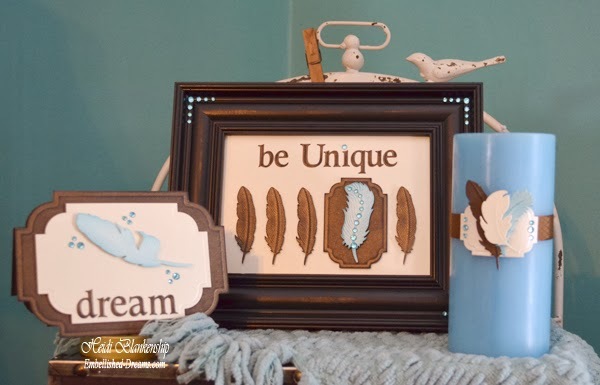 Then I inked the edges with Memento Teal Zeal ink from Imagine Crafts®/Tsukineko®. When applying ink to the edges of paper I like to use a cotton ball in a circular motion for a soft even coverage. For the second mat/layer of the card I used Champagne Metallic cardstock and the #6 die template in the S5-207 Labels Thirty-Eight set to cut/emboss the label shape. 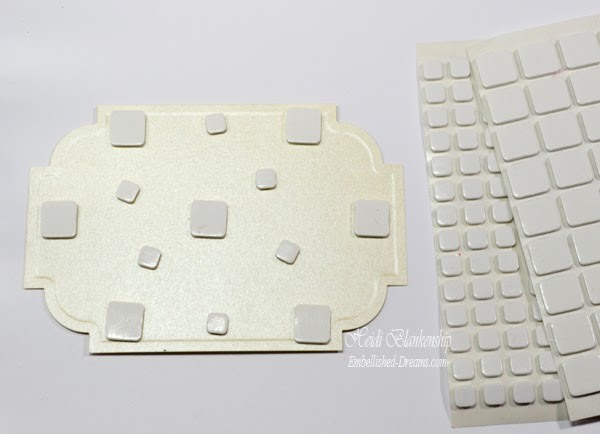 Then I added 3D Foam Squares from Scrapbook Adhesives by 3L® to the backside of the die cut. I added the die cut letters to the bottom of the label shape and then I added the feather. I used 3D Foam Squares to pop up the the feather. To finish off the card I added a few Aquamarine Flat Back Crystals from ButterBeeScraps. I used glossy accents to apply the crystals. Then I added this entire piece to the front of the shape card. Here is another look at the finished card. I have several pictures for the tutorial so you can see all of the steps but this is a really quick and easy card to put together--only about 5-10 minute! 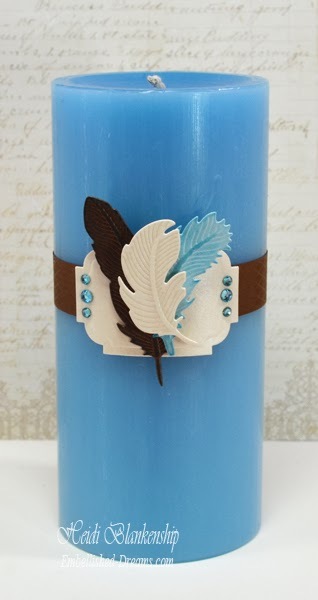 a decorative belly band for a candle using the S5-207 Labels Thirty-Eight and S4-428 Feathers die templates. 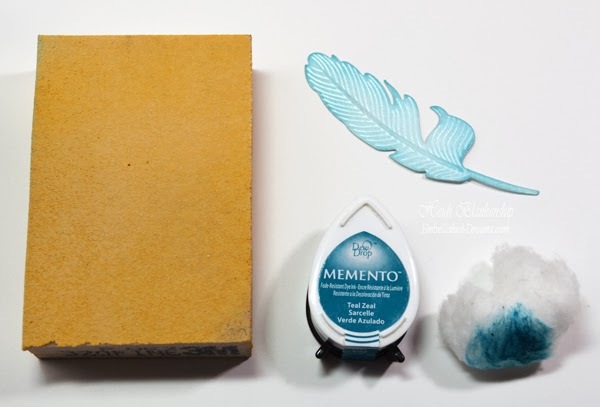 These are great DIY projects and very quick and easy to do! 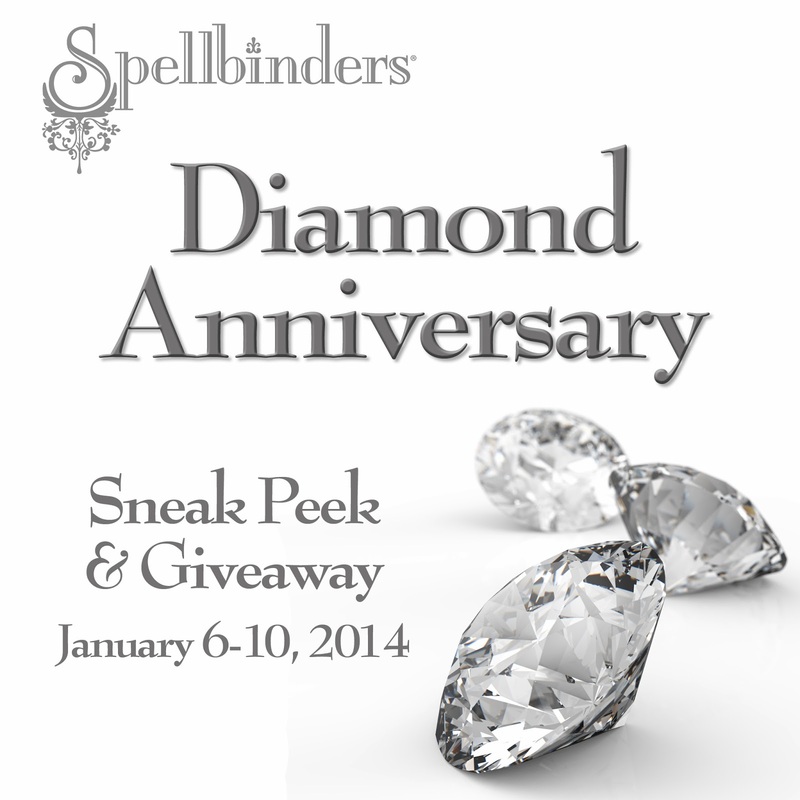 Spellbinders is choosing one winner from each sneak peek blog to win that day's NEW die template sets. There is also one Grand Prize, which includes all the NEW Spellbinders' products revealed during our sneak peek event, as well as a Spellbinders Grand Calibur® Machine and Raspberry Plate! How do you enter to win the contest? 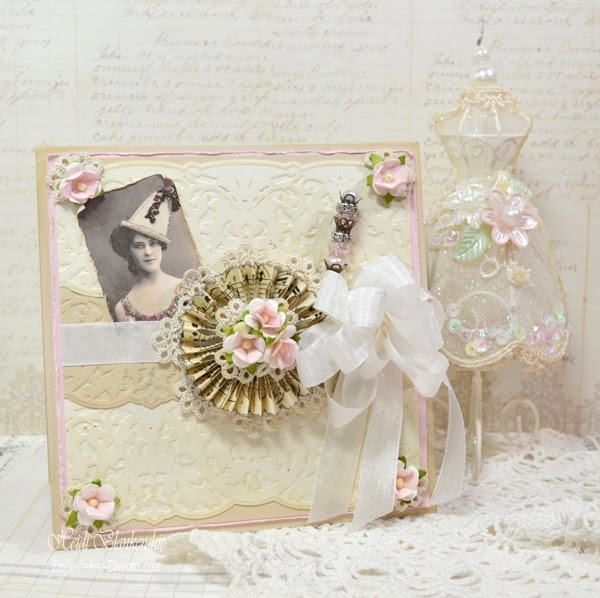 You should receive an email confirmation when you have successfully entered the Spellbinders Paper Arts Giveaway. While I truly appreciate comments left, commenting does NOT enter you into the giveaway--only filling out and submitting the entry form does that! Any questions? Address them to ContestQuestions@Spellbinders.us. Seth Apter's blog The Altered Page today for more chances to win!